are you already using the translate action, set to PerSeconds? 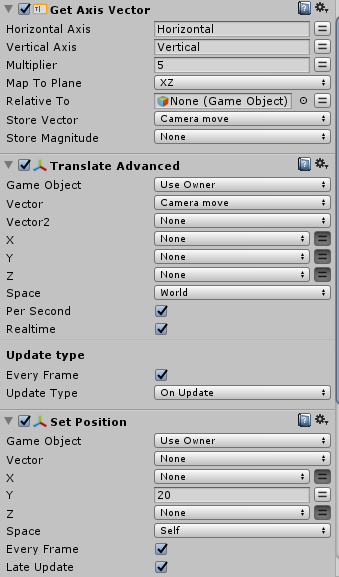 else for this I would use iTween or any other tweening engine that supports PlayMaker, you can move objects at realtime. Let me know if you are not progressing with the above, I'll see if I can modify the translate action to work in realtime as well. ok, it's up, Get the TranslateAdvanced Action, it will feature a new option "Realtime" that you need to check along with "PerSeconds" and then it will unaffected by time scale. well, you need to switch states and use either realtime option or not. that's all there is to it. you need to test it on its own to make the action is not the source of the problem. and for me it works perfectly, so something is odd on your setup. can you confirm it works also on your end on a basic setup? if it does, then you need to cut down your problem and start on a good base and add complexity one step at a time. 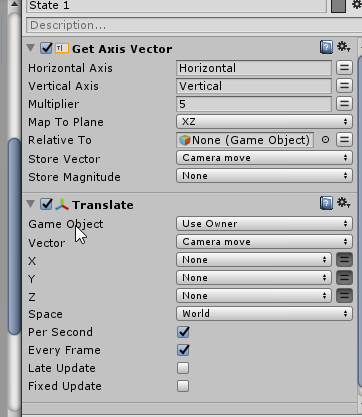 yep, good catch, Unity Input is dependent on Time scale! I made a new custom action on the ecosystem: GetAxisRaw and I also added the option to the already existing custom action GetAxisVectorExtended.